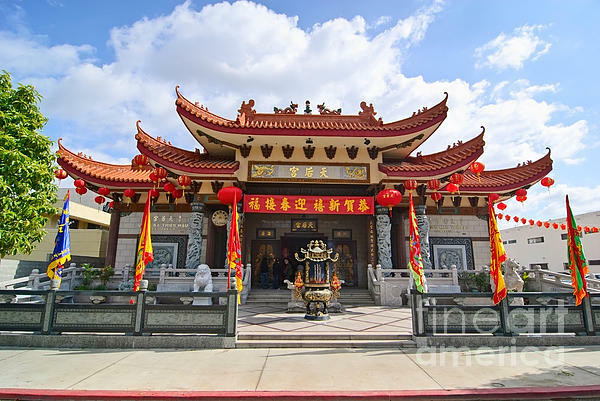 There are no comments for Thien Hau Temple A Taoist Temple In Chinatown Of Los Angeles.. Click here to post the first comment. Thien Hau Temple, also known as Ch�a B� Thi�n Hậu in Vietnamese and as Tiān H�u Gōng (天后宫) in Chinese, is a Taoist temple in Los Angeles Chinatown. 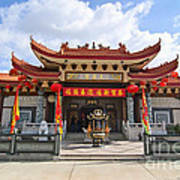 It is one of the more popular areas for worship and tourism in the Los Angeles area. 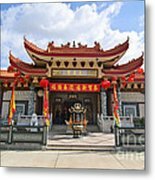 Thien Hau Temple is dedicated to Mazu, the Taoist goddess of the sea and patron saint to sailors, fishermen, and to those whose cultures are associated with the sea, along with Guan Yu, the god of wars, brotherhood, and righteousness, and Fu De, the god of the earth, wealth and merit. Dizang, a bodhisattva from the Buddhist faith also has his own shrine in the temple. On the eve of Chinese New Year, members from various communities gather to receive blessings and to burn incense in worship of the deities. 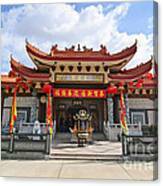 Lion dancers perform and firecrackers are popped in order to scare away an evil spirits.